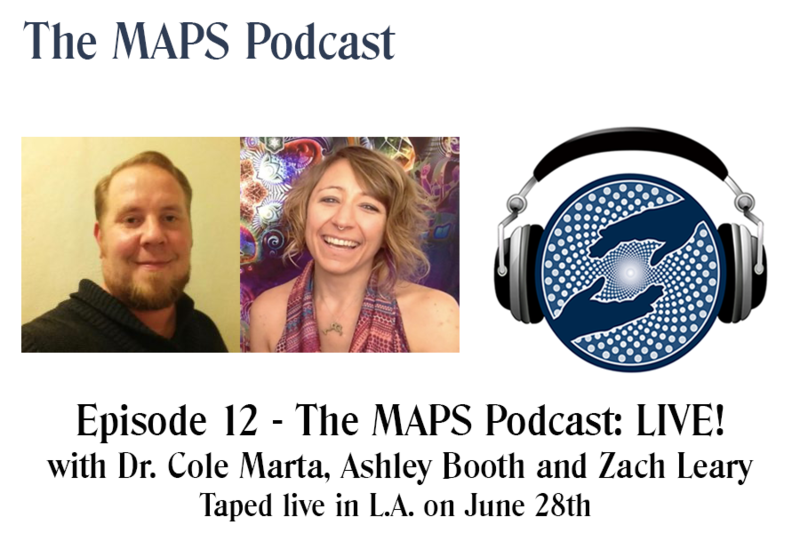 MAPS Podcast: Episode 12 - The MAPS Podcast: LIVE from L.A.! Episode 12 - The MAPS Podcast: LIVE from L.A.! This episode of the podcast was taped LIVE in Los Angeles on June 28th in partnership with the Aware Project. Zach Leary led an hour long engaging, funny and insightful panel discussion with the great wisdom of Dr. Cole Marta and Ashley Booth. The conversation ranged from a look at the current state of psychedelic research, how culture and community plays a role, actual medical updates from the front lines and each persons own personal awakenings and journeys. The Aware Project hosts bi-monthly salons that are not to be missed if you're in the LA area. Also, look out for more live tapings of The MAPS Podcast. Dr. Marta completed undergraduate studies at UC – Santa Cruz majoring in molecular, cellular, and developmental biology where he graduated with highest honors in the major, with a focus on genetics. After graduating, he was a Junior Specialist in a Howard Hughes Medical Institute laboratory studying neurogenetics in the model organism C. Elegans. Ashley Booth, M.S. is a scientist, philosopher, and advocate. She is the founder of a Los Angeles based community education group called the Aware Project (awareproject.org) and the co-producer of the monthly Psychedelic Awareness Salon series and the first Bicycle Day event in Los Angeles (www.bicycleday.la). She has given numerous talks at festivals and conferences to balance the public conversation about psychedelics, spread accurate information, and give a new face to psychedelia. She believes that the conscious use of psychedelics is an important tool to be utilized in medicine, creativity, and the creation of a more peaceful world.